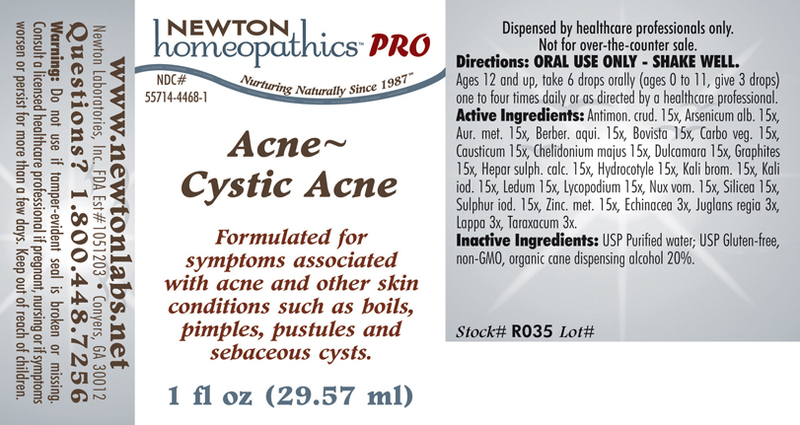 ACNE~CYSTIC ACNE Formulated for symptoms associated with acne and other skin conditions such as boils, pimples, pustules and sebaceous cysts. Directions: ORAL USE ONLY - SHAKE WELL. Ages 12 and up, take 6 drops (ages 0 to 11, give 3 drops) one to four times daily or as directed by a healthcare professional. Antimon. crud. 15x, Arsenicum alb.5x, Aur. met. 15x, Berber. aqui. 15x, Bovista 15x, Carbo veg. 15x, Causticum 15x, Chelidonium majus 15x, Dulcamara 15x, Graphites 15x, Hepar sulph. calc. 15x, Hydrocotyle 15x, Kali brom. 15x, Kali iod. 15x, Ledum 15x, Lycopodium 15x, Nux vom. 15x, Silicea 15x, Sulphur iod. 15x, Zinc. met. 15x, Echinacea 3x, Juglans regia 3x, Lappa 3x, Taraxacum 3x.